My last week of this journey has taken me to the southern corner of Kazakhstan which was the most northerly reach of the Great Silk Road. 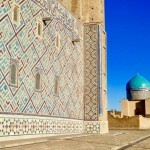 The small town of Turkistan is home to some incredible Timurid architecture from the 14th century which was the ‘prototype’ for the magnificent city Tamerlane went on to build in Samarkand. Although it required an almost thousand kilometre detour, like a bird to nectar I felt drawn to see the architecture. 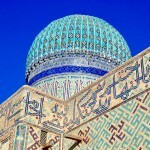 While trying to curry favour with an element of his distant empire Tamerlane began constructing an impressive mausoleum for a revered holy Sufi. The massive shrine has the largest brick dome in all of Central Asia (18m across) and along with the architectural design was the first melding with ‘imported’ (ie. 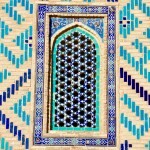 conquered and relocated) Persian decoration and design using the exquisite blue majolica glazed tiles. If you’ve tracked my progress on a map over the last 2 months it must look like the path of a drunken bee doubling back on myself – the modern borders have necessitated a circuitous route navigating a jigsaw puzzle of border crossings and visa restrictions. Although I’ve travelled over 9000km by road on this trip I’ve actually ended up in Almaty- only a few hundred kilometres from where I started in Bishkek. 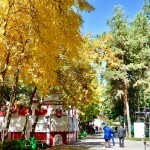 Almaty is a pleasant city ringed by snow capped mountains. 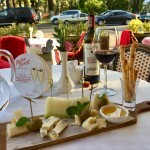 It has been a pleasant place to to stroll with its wide tree-lined avenues, parks and fountains. The pleasure is made all the greater at the moment by the golden autumn colours of the trees and the crunch of fallen leaves under foot. It’s where my journey on the Silk Road ends for the moment but it’s been a soft landing. 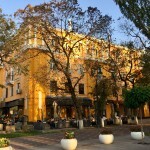 Like a slice of Europe in the middle of Central Asia Almaty is a haven of coffee houses, terrace restaurants, wine bars and little shops. Like the ancient caravan serais which grew to house the needs of travelling merchants Almaty has proved itself an excellent final watering hole! This entry was posted in Kazakhstan and tagged Almaty, Kazakhstan, Turkistan. Bookmark the permalink.